The excellent spatial, submillimetre resolution obtained with MRI is hugely beneficial especially when combined with PET, known for its remarkably high sensitivity. Thus, the synergistic combination of simultaneous PET and MRI holds great promise for functional molecular imaging of unprecedented quality. The increasing number of hybrid PET/MR scanners available has sparked research interest in bimodal PET/MR probes. These agents show great potential for biomarker-responsive imaging as well as for ‘PET-guided’ high resolution MRI (de Rosales, J. Labelled Compd. 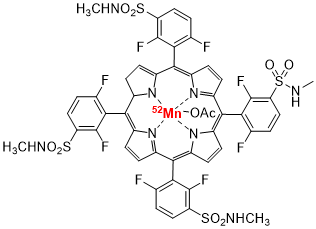 Radipharm., 2014, 57, 298; A. Louie, Chem. Rev., 2010, 110, 3146). There is though the challenge of designing such tracers due to the large sensitivity difference between PET and MRI i.e. nanomolar vs. millimolar concentration of imaging agent, respectively. This problem may be overcome by adding tiny amounts of radionuclide to an MRI contrast agent (Archibald et al, Faraday Discuss., 2014, 175, 59). To take advantage of such a bimodal construct both reporter molecules should ideally exhibit an identical biodistribution and pharmacokinetic behaviour in vivo i.e. the MR and PET reporters should be chemically identical (Coenen et al, Dalton Trans., 2016, 45, 1315). For MR contrast, there have been concerns over the toxicity of gadolinium (Gd)-based contrast agents due to the role that they play in the development of nephrogenic systemic fibrosis as well as Gd accumulation in the basal ganglia and dentate nucleus (Takenaka et al, Radiology, 2014, 270, 834) and in eyes of stroke patients https://www.nih.gov/news-events/news-releases/eye-could-provide-window-brain-after-stroke. Manganese (Mn)-based complexes are being increasingly considered as Gd-alternatives. The Mn2+ ion exhibits all of the physical properties that make Gd3+ a highly efficient imaging probe in T1-weighted MR protocols i.e. high spin quantum number, long longitudinal electronic relaxation times and fast water exchange kinetics. Mn is biogenic, and intravenously administered Mn2+ is cleared via biliary excretion. Challenges in using Mn within contrast agents remain in (i) making sure that excess Mn is properly excreted (Mn2+ is thought to mimic calcium and thus can enter cells through Ca2+ channels) and not used in patients with reduced liver function and (ii) designing a stable Mns2+-chelate due to the extreme lability of the Mn2+ ion (Caravan et al, J. Am. Chem. Soc., 2015, 137, 15548) and ease of oxidation to Mn3+. 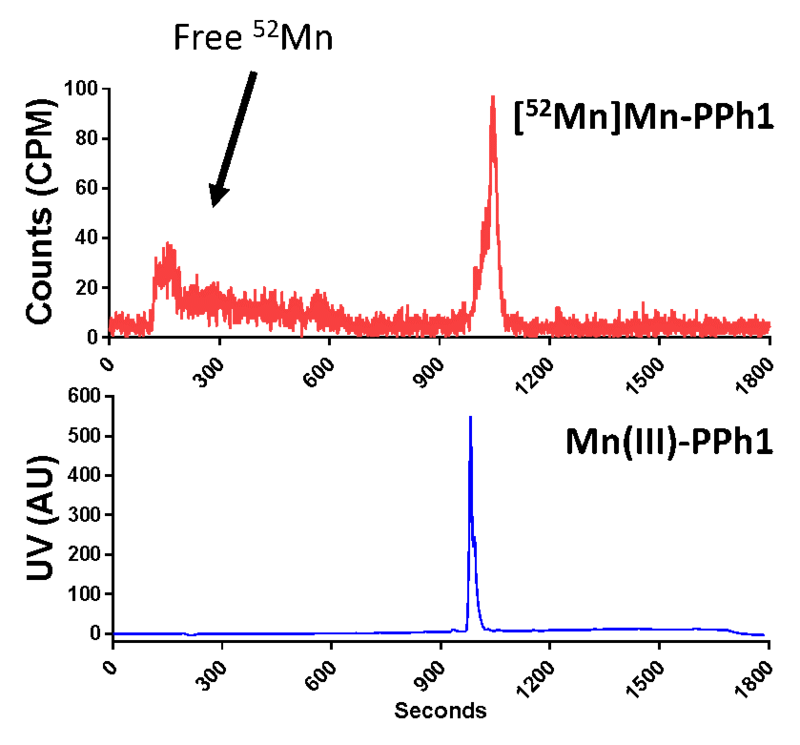 52Mn radiolabelling is in its infancy but our groups have very recently initiated a range of labelling studies with hydroxyquinolines and functionalised porphyrins (see figure, alongside the radioHPLC trace). Both these systems show promise and will be further investigated in the early phases of the project, particularly the functionalised porphyrins. Other chelate ligand systems will be developed alongside manganese coordination chemistry, followed by 52Mn and 51Mn radiolabelling, PET and MR image analysis and biological evaluation.